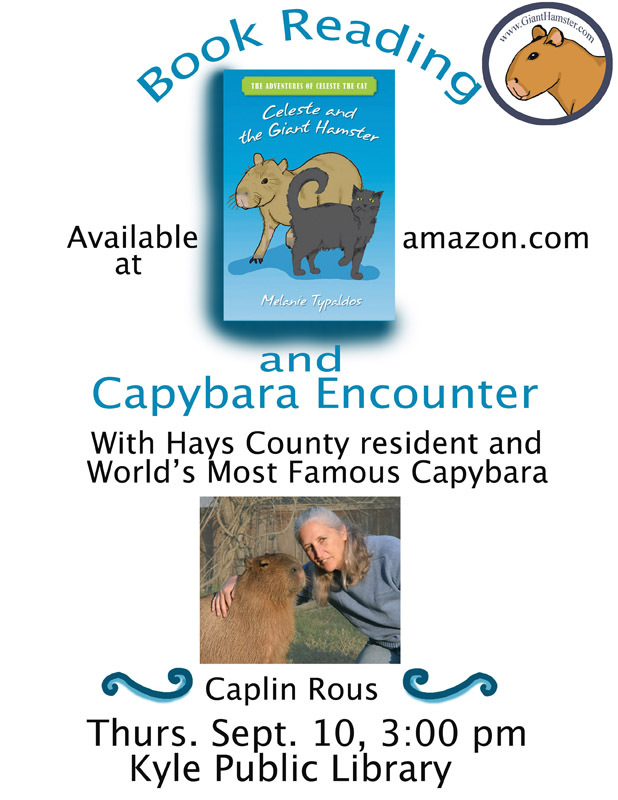 Last Friday my owner and I took a quick trip down the the Kyle Public Library to see if they were interested in us doing one of our book reading/capybara encounters. Before the library opened, I met with some new friends, Shirley Bauder and her two granddaughters Chelsea and Cayla. Shirley took all the photos you see in this post. 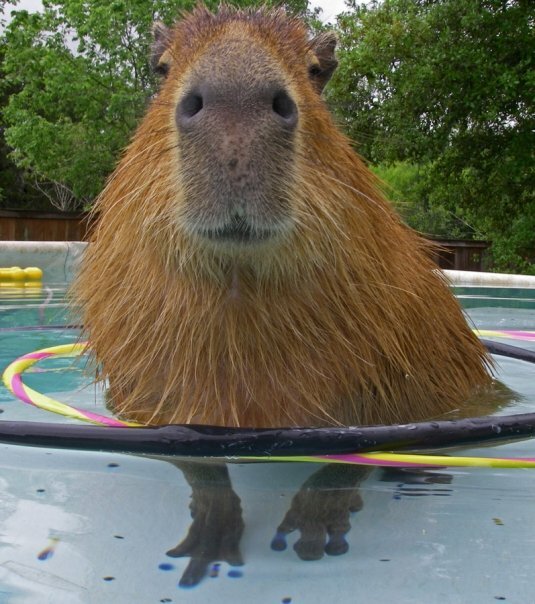 (Thanks!) I loved having the kids feed me blueberries, which are one of my very favorite treats. 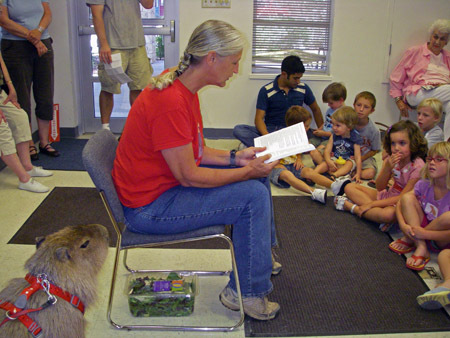 When the library opened, they asked me if I could stay until 10:30, which is story time for the little kids. Well, we weren’t very prepared but then you don’t have to be when you have a cute animal like me around to provide the entertainment. 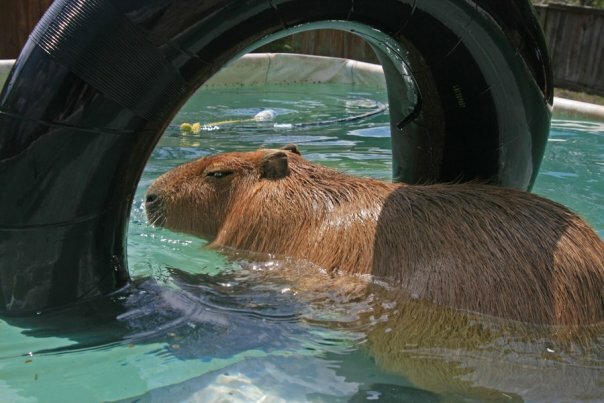 My owner got to talk a little bit about Celeste and the Giant Hamster, although it is really for an older audience than we had. And she gave a copy to the library so that all the local kids can read it. 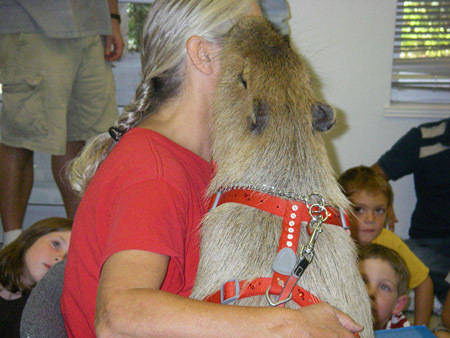 Plus we got invited back for an official book reading/capybara encounter. We still have to pick a time and date for that. I will let y’all know when it is settled. I heard on the news today (boring but my owner watches it for some reason) that Judge Sonia Sotomayor became the first Latina supreme court justice in US history. 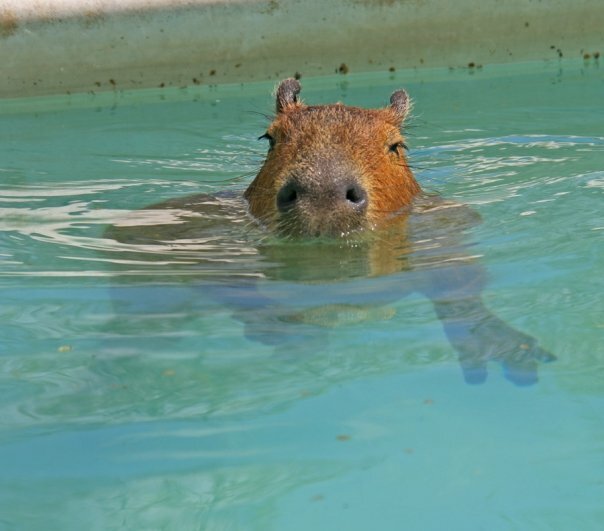 She and I have something in common: I made a first for capybaras today. 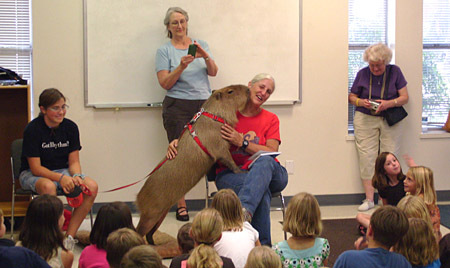 I was the first capybara in all of history, probably anywhere on the planet to attend a book reading at a public library. We had a whole entourage to go to the library. First there was me. 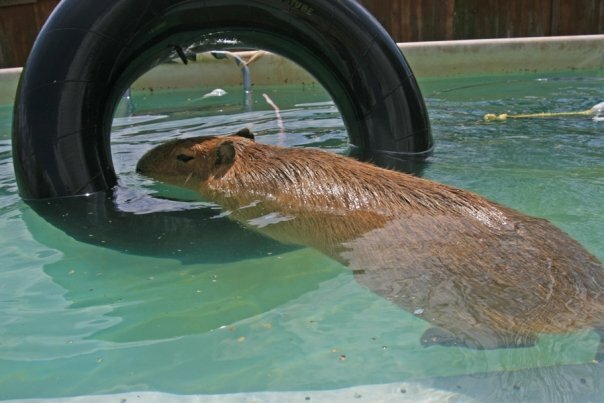 The event was actually billed as a book reading / capybara encounter which wouldn’t be anything but a book reading without the capybara would it? My owner also came because she had to do the reading part and she also serves as my chauffeur. 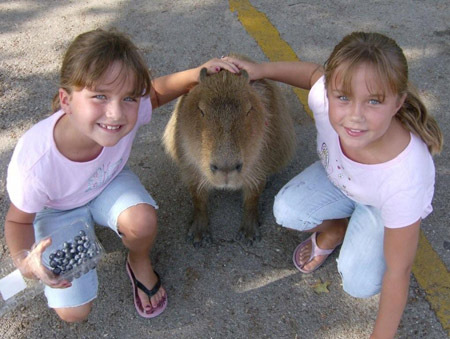 Then my friend Clarissa, who is 13, came to be a “capybara handler.” I think she was really more crowd control. And Elizabeth, Clarissa’s mom, came to take photos. Lastly, Rick, my male human came to do the video. Wow, that was a lot of us. I was a bit worried that there were going to be more of us then them. We got to the library and almost immediately ran into some people who had come for the book reading. That was a good sign. We got set up in our room off to the side of the main library. The floor in there was slick but my owner brought one of my beds for me to lie on and they pulled a couple of mats in from outside so I could walk more easily. Still, I felt uncomfortable in there so I dragged my owner back outside where we ran into more and more people coming to see me. I put on my best face. The sun sparkled off the sequins in my harness about which I got many, many compliments. Thanks to Mansy OLeary who decorated my harness for me I really feel like a star when I wear it. 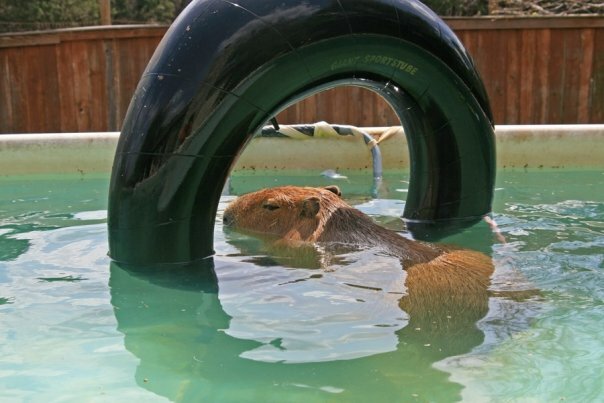 The official capybara encountered started when we went back inside. My owner gave all of the kids blueberries and let them come up to pet and feed me. That was a good part because I love blueberries. 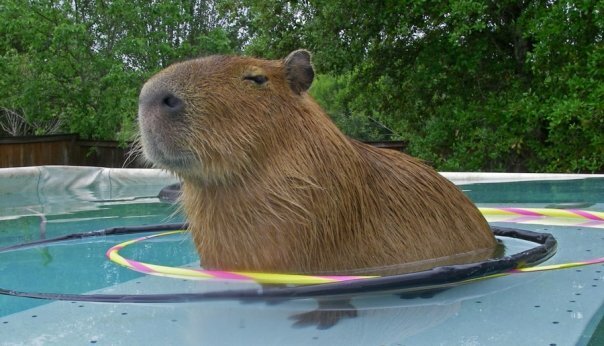 Then she told them all about me, capybaras, and rodents in general. Mostly that part went well. 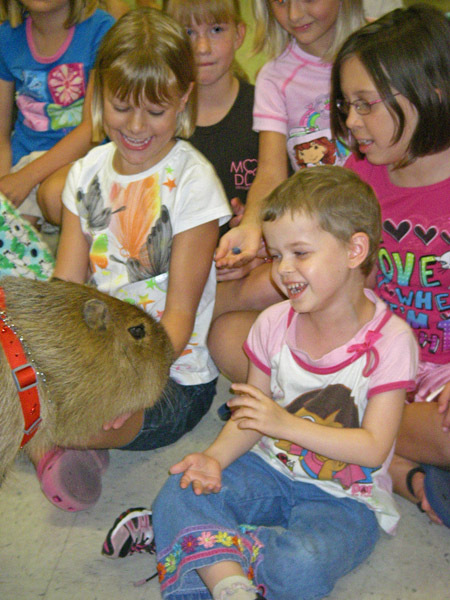 The kids and adults asked a lot of good questions and I think my owner answered them all truthfully. 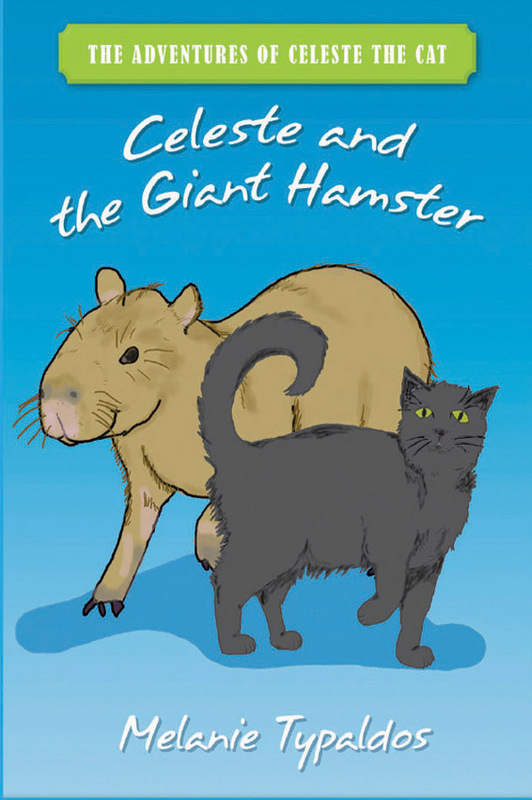 For the reading, my owner started at the part when Celeste the Cat meets up with little calico Ruby and ended where Tiger gets knocked off the back of the capybara. Doesn’t that just make you want it to figure out what happened in between? I think most of the kids were pretty interested too but a lot of them were really too young for the book. 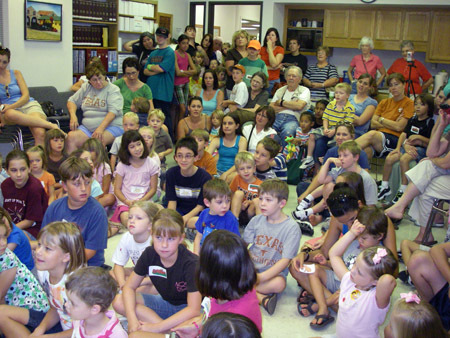 And the room was PACKED, spilling out the back door and into the library proper. I have to say, there was some childish restlessness. Being a little restless myself, I stood up and put my paws on my owner’s lap and then I licked her face. People loved that. At the end the library people served lemonaid and brownies and everyone poured outside where there was more room. A long line formed of people who wanted to pet me or get their photo taken with me. I would only stand still for a treat. 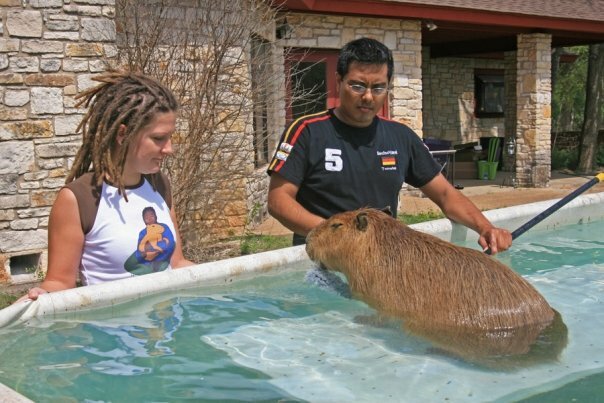 I think everyone got to pet me and feed me and I am sure everyone came away thinking that we capybaras are wonderful animals. 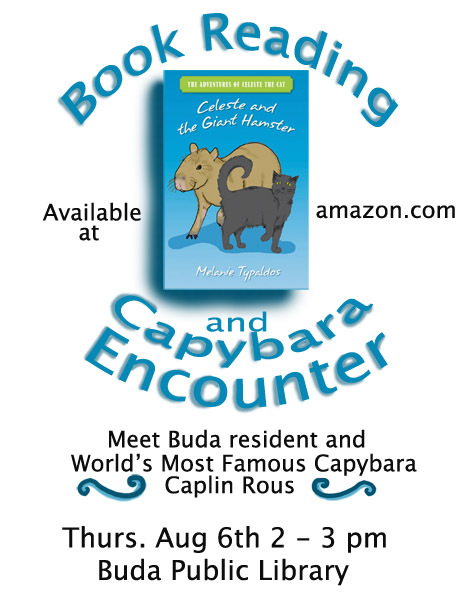 If you would like me to appear at your school or library and you live in the Austin/Buda area, use the contact button to send me an email. 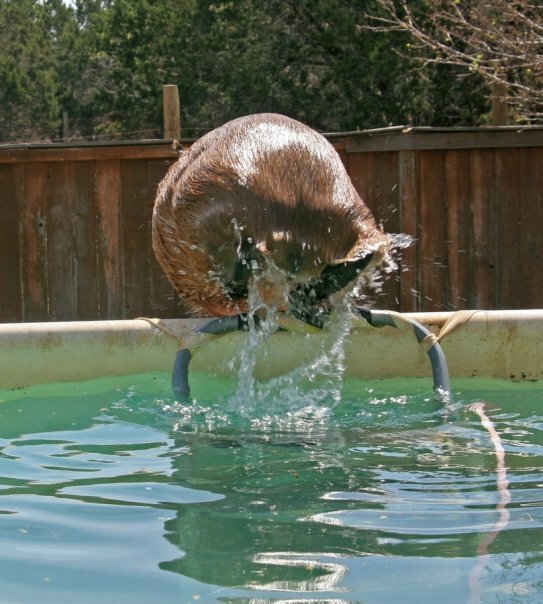 I had a great time and I’m sure I can drag my owner to at least a couple more of these things. Flier pretty much says it all.